Laura from Silk Road Gourmet has made garum (she discusses garum brilliantly HERE and the process of making it HERE) and and aged it for nearly a year before sending it out to a lucky few who have been asked to make something with it. The lucky few includes some rather remarkable food historians like Ken Albala, Charles Perry (he's already written his contribution –– Pullus Frontonianus) and Sally Grainger, I am so honored to be included in this illustrious group –– WOW. Now I get to come closer to the flavor of ancient Rome than I ever thought possible because I have real garum to season my dishes. For the record, garum was a condiment used in Greek, Roman, and Byzantine cuisine. It was a kind of fermented fish sauce that employed the digestive juices of the innards of the fish to make a refined product. It’s those juices which makes it different from the fish sauce we find in Asian cuisine today. Mixed with wine (oenogarum) or water (hydrogarum) it was used on everything. It was even considered a cure for ailments and was used as an ingredient in some cosmetics. The finished product contained amino acids, minerals and B vitamins as well as monosodium glutamate ­­–– it added an umami flavor to boot. Its factories were the original bad industrial neighbors –– no one wanted to live downwind of a garum factory. Residue of a garum container found in Pompei revealed that the garum made there was made from Bogues, a summer-swarming fish of the family of sea breams like porgies in the US. I believe each region used their local fish to make their own garum and that styles varied with regions and their picean populations. After making murri (that I wrote about HERE), I know what an ancient condiment can do for the taste of a dish… it is revelatory. But what to make to honor the gift of this fabled ancient fish sauce/seasoning? I decided to take a detour from the pages of Apicius and go Imperial to get me in the mood for cooking with such a treat –– just a little off the well-known Roman path –– taking a journey inspired by a painting. When you imagine cuisine during the last gasps of the Roman Empire, most people think of mad Emperors and their insane parties before they think of the recipes and elegant entertaining of the legendary gourmand, Apicius. Of course it is only through those writings that we have a clearer idea of what was probably eaten at those wild orgies that only unlimited power (so no consequences for obscene indulgence), bottomless reasources and centuries of inbreeding could invent. 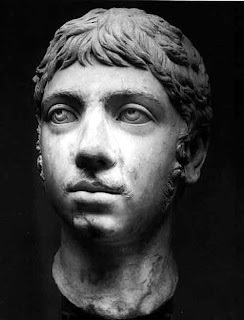 Most people know about the delusional Nero (37-68) of course and equally delusional and cruel Caligula (12-41) (thanks to the glorious I Claudius PBS show in the 1970s) but not many know about a later emperor, Heliogabalus (also known as Elagabalus) (203-22) and that is too bad. He was quite a piece of work. 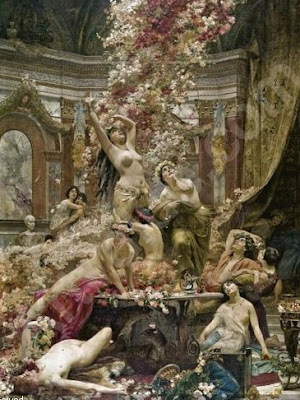 I first discovered him through the painting, The Roses of Heliogabalus, by Alma-Tadema many years ago and thought the work was charming –– a rose petal dinner –– glorious excess, right? Wrong. A year ago, I came across the painting again but this time looked up Heliogabalus/Elagabalus (thank you, Wikipedia). Boy, was I wrong. The painting depicts Emperor Heliogabalus suffocating his guests to death in rose petals for fun… yes, for fun. Not so charming after all, but quite a legend. Did it happen? The more I read history and live through it, the more I know that there is no way to say “accurate history”. Some facts are accurate (like someone died on such and such a date), but commentary on history’s players is insanely subjective even when done in the moment (just think Fox News vs The New York Times). Done much later, it can be pure fiction and events become grander or more horrific like the telling of any ancient ‘fish story’ that goes from catching a 2 pound salmon to a death match with a 200 pound leviathon –– and that’s just within one or two generations of a story over a lifetime or two, not centuries! He did wear “the garb of a Syrian priest, a long sleeved tunic down to his feet that was easily confused with female dress: and he made up his face and danced around the altar to the sound of cymbals and drums.” said Judith Weingarten. All this exoticism was too much for the Romans who got rid of him fairly quickly. Still, the most virulent commentaries on his escapades were written in the 4th century work, Historia Augusta, 200 years after his death. 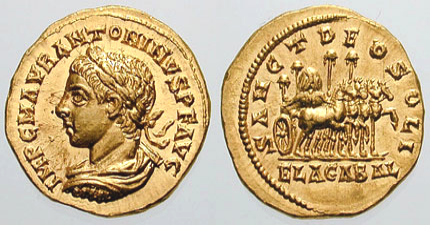 A contemporary of Heliogabalus, Cassius Dio, did mention a comment by an enemy of the emperor. 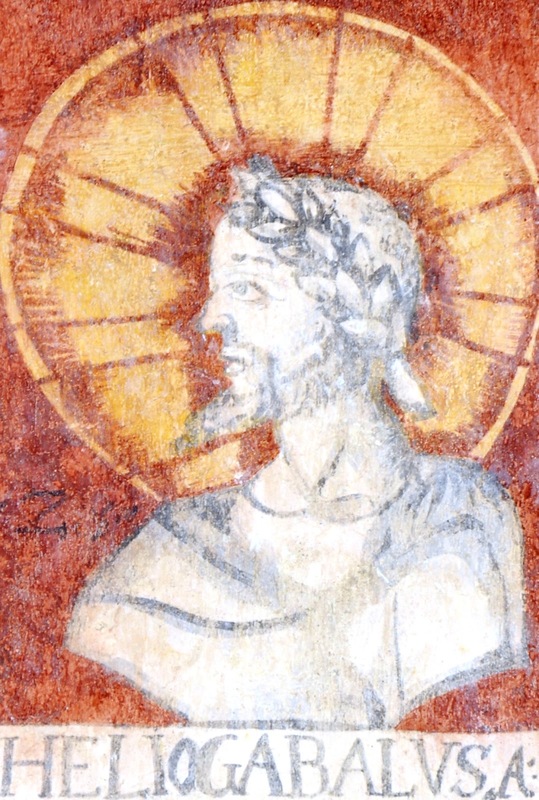 He said Macrinus wrote to the senate that Heliogabalus was a boy and that he was mad –– but this guy was hardly going to be fair and balanced about someone he wanted to take out. Cassius Dio also reported that Heliogabalus married and divorced 5 women including a Vestal Virgin (a monstrous deed that horrified Rome) but that his most lasting relationship was with a chariot driver named Hierocles whom he referred to as his husband. 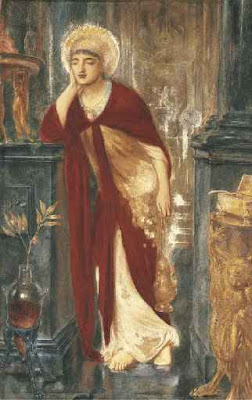 The later histories go into the insane parties, reports that Heliogabalus was a transgendered soul who wanted female parts attached to him, that he prostituted himself not only in brothels but in the Imperial palace itself. Kurt Vonnegut tells a favorite story of Heliogabalus that involves a metal bull at the Emperor’s dinners into which a person was placed and locked inside. Then a fire was lit beneath it so that the screams that issued from the open mouth of the bull were the sound track to the dinner –– one would imagine invitations to these events were looked upon with dread. Oh yes, it is said he invented the whoopee-cushion (put the screams and raspberries together in your head for the worst party-mix tape ever). However, this story was written centuries after his death and it is probable that it was utterly apocryphal. It is true that Damnatio memoria (a state-issued erasure from history) was decreed after he was killed and his body tossed unceremoniously in the river, but for what exactly we will never know for sure. In his case the fiction that arose after the censure was probably wilder than the truth. At the very least his foreign ways and foreign gods won him no friends (he installed a woman in the Senate –– an innovation that went away the moment he did). Still, Imperial parties must have been something. 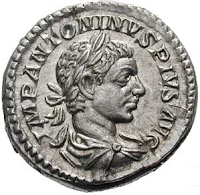 Even before Heliogabalus and his rose parties, Petronius in 60AD talked about oil rubdowns before dinner, olives served from bags on a life-size bronze donkey, dormice dipped in honey and rolled in poppyseeds. Everyone knows about dining on hummingbird tongues and other wildly exotic creatures that were ingested at these Imperial feasts but the fact is that most of the time Emperors probably ate many of the same things that appear in Apician cookbooks (that I wrote about HERE). And why not? The food is so remarkably good, sophisticated and modern in so many ways. It would shine at any banquet with or without the golden dishes, bushels of rose-petals and silk cushions (whoopee or otherwise). The green sauces for the chicken are not unlike a more complex pesto that would become ubiquitous in Italian cuisine a milennium or so later. The Romans loved sauces and I loved the many recipes for the sauces so much, I just couldn’t stop at one so made 2, both are fabulous. Although I could only guess at the proportions, one turned out slightly sweet and the other slightly tangy. They are delicious with salmon. The asparagus ‘quiche’ is brilliantly flavored and accessorized with meat ( I did take the liberty of substituting grouse meat for ‘figpeckers’ but duck breast would work well as would chicken tenders if you wanted a milder flavor) and reminded me of the subtle beauty of the Japanese custard dish, chawan mushi (that I wrote about HERE . Just a note for ingredients. As you may have surmised, herbs like lovage and rue are not on supermarket shelves. I sent for mine (and they arrived in 4 days) from a wonderful resource I found last year when I needed hyssop and pennyroyal for medieval recipes. The Grower’s Exchange in Virginia has a remarkable selection of unusual herbs and beautiful plants. The arrive in perfect condition and after 3 deliveries I can say that with confidence. Hyssop is one of my favorite discoveries and tastes like many sweet herbs all in one plant, pennyroyal is an incredibly sweet mint that is wonderful and lovage is a good-sized perennial that looks like giant parsley and tastes like celery… you only need a bit to flavor a dish. Rue is interesting, bitter and bad for you in large quantities (like pennyroyal). It has been used for thousands of years in cooking and as a medicine for everything from insect repellant to eye wash. The recipes (written in capitals) that follow are taken verbatim from Apicius. After that are my versions. PEPPER, LOVAGE, PARSLEY, CELERY SEED, RUE, PINE NUTS, DATES, HONEY, VINEGAR, BROTH, MUSTARD AND A LITTLE OIL. Warm the broth and soak the date in it till softened. Puree in a blender with the stock. Add the herbs and nuts and spices, puree. Add the vinegar and oil and blend. PEPPER, LOVAGE, PARSLEY, DRY MINT, FENNEL BLOSSOMS  MOISTENED WITH WINE; ADD ROASTED NUTS FROM PONTUS  OR ALMONDS, A LITTLE HONEY, WINE, VINEGAR, AND BROTH TO TASTE. PUT OIL IN A POT, AND HEAT AND STIR THE SAUCE, ADDING GREEN CELERY SEED, CAT-MINT; CARVE THE FOWL AND COVER WITH THE SAUCE. Put first 8 ingredients into a blender and blend ingredients including the hazelnuts, then toss in the rest and grind. Rinse the chicken and pat dry. Leave on a rack in the fridge for 1 hour, uncovered. Remove then rub the chicken with garum and sprinkle with salt and pepper. Cook for 1 hour to 1 hour 15 minutes. Allow to rest 15 minutes before carving for crisp skinned but very juicy chicken. COLD ASPARAGUS PIE IS MADE IN THIS MANNER  TAKE WELL CLEANED [cooked] ASPARAGUS, CRUSH IT IN THE MORTAR, DILUTE WITH WATER AND PRESENTLY STRAIN IT THROUGH THE COLANDER. NOW TRIM, PREPARE [i.e. cook or roast] FIGPECKERS  [and hold them in readiness]. 3  SCRUPLES OF PEPPER ARE CRUSHED IN THE MORTAR, ADD BROTH, A GLASS OF WINE, PUT THIS IN A SAUCEPAN WITH 3 OUNCES OF OIL, HEAT THOROUGHLY. MEANWHILE OIL YOUR PIE MOULD, AND WITH 6 EGGS, FLAVORED WITH ŒNOGARUM, AND THE ASPARAGUS PREPARATION AS DESCRIBED ABOVE; THICKEN THE MIXTURE ON THE HOT ASHES. THEREUPON ARRANGE THE FIGPECKERS IN THE MOULD, COVER THEM WITH THIS PURÉE, BAKE THE DISH. [When cold, unmould it] SPRINKLE WITH PEPPER AND SERVE. Steam the asparagus tips for 5 minutes and the stalks for 8. Chop the stalks and puree with 2 T stock. In an ovenproof skillet, warm the pepper, oil, wine and stock for a few minutes. Pour into the skillet and heat on the stovetop over medium heat for a few minutes until the eggs are slightly set on the bottom. Put in the oven for 10 minutes. Salt and pepper the breasts and sauté in 2 t oil for a few moments on each side and remove. Let rest for a few moments. Slice into 3 or 4 slices each and reserve. After the first 10 minutes, remove the skillet from the oven and lay the reserved asparagus tips and meat into the eggs which should be nearly set. Put back in the over for 5 more minutes or until set. Serve hot or cold. Thanks again to my friend Linda at Statewide Marble in Jersey City for the gorgeous piece of stone. Another beautifully researched and exquisite dish. I'm so impressed with your work. This is so decadent. You have access to such amazing ingredients. I wish I lived closer. Hi lostpastremembered I just love your blog. Everytime I come here I learn something new. I just love how you mix food with history. That makes both much more interesting. I can always count on a fantastic read when I visit you, Deana! Don't you love how research leads you from one thing to another? Love your link to The Growers Exchange. They sound enormously helpful, especially to someone who requires unusual herbs in their cooking. Loved reading the ingredients in the sauces and the asparagus custard looks divine. The grouse substitution is perfect (agree duck would be fabulous), in that I don't think I've seen any figpecker on D'Artagnan's mail order form. Bet they would be sweet from eating figs, however. Are they smaller than humingbirds I wonder? I don't quite believe that upon a midday in autumnal E Australia I have been privileged to have been part of this learning curve. The knowledge will be 'devoured'! Thank you!! Quite right about how slippery history can be, ancient history especially. But boy, it makes for quite a story! Funnily I was discussing what the Romans had for dinner recently with someone so thanks for your interesting and insightful post. I discovered the book and series of I Claudius last year and find it wonderful, though of course, Graves wanted to entertain us. The colours and presentation of your dishes are simply wonderful and I'd never have considered asparagus custard. Your post is, as always, an interesting read. However, as an early student of Latin (high school - two years), and later, a professor of Psychology and of Higher Education, one should be very careful of believing the modern-day spin on the leaders of the ancient world. Perhaps your husband, a professor of history, has already addressed that issue. As a Septuagenarian, I have learned to sit back, enjoy the views of the younger generation(s), and hope that they do not become intellectually lost in their perceived fantasies of the past. Deana your lovely photos are only matched by your interesting words! 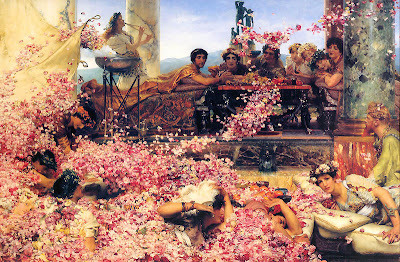 Garum factories and rose petal suffocation - what fun times they had back then ;) Actually, I love reading about ancient Roman times and wish they hadn't cancelled the HBO series Rome! What a delicious fowl you made and I am so impressed that you actually used garum in the sauce! I must remember the trick about liberal salting to get the crispy skin. Your commenters are almost as interesting as your research! My little guys love reading about Rome, and the youngest just did a research paper about the Coliseum. It's amazing how little various sources agree with each other, even on something solid like that. Chicken sounds like a good alternative to duck or grouse, although I'd wonder if the skin would dry too much by being salted. What an interesting blog. You just won me over. Great research and recipes. For lovage, try an Eastern European grocery. It's also *very* easy to grow yourself (but it is a large plant, so don't try to grow it in a pot). As for rue, be careful, some people react very unpleasantly to it.